There is a lot on the cards for Rambert during the remainder of this year, and into next year too. As part of the company’s work there will be new works by Marion Motin and Benoit Swan Pouffer, the UK revivals of Wayne McGregor’s PreSentient and Hofesh Shechter’s In Your Rooms, and new partnerships with Manchester International Festival, The Royal Ballet and Théâtre de la Ville, Paris. In addition to this, Rambert2 launches its inaugural season, including works by Rafael Bonachela and Sharon Eyal, and Ohad Naharin’s Kamuyot. Rambert will present the first major UK revivals of two landmark dance works alongside a new creation by Marion Motin, whose hip hop-influenced style is probably best known through her work for Christine and the Queens and her VMA-nominated video for Dua Lipa. In 2002 Wayne McGregor found the perfect match for his signature style of angular movement and lyrical phrasing in the music of Steve Reich’s Triple Quartet. The piece he made for Rambert – PreSentient – marked the arrival of a major talent on the world stage. Hofesh Shechter had a similar impact in 2007 with In Your Rooms, a piece blending the personal and the political. Rambert then presents its new company, Rambert 2, with a programme of dance showcasing the most exhilarating and fierce choreography around today. 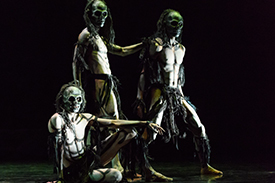 The triple bill includes a new creation by Rambert’s Guest Artistic Director Benoit Swan Pouffer, with original music by Brixton-born electronic and dancehall artist GAIKA. Rambert2 will also perform two works that launched the international careers of their choreographers: E2 7SD is a duet by Sydney Dance Company artistic Director and former Rambert dancer Rafael Bonachela, and Killer Pig, by Israeli dance star Sharon Eyal, showcases her intense and distinctive movement style. Rambert will also create a new, large-scale dance work, set to premiere at Manchester International Festival in summer 2019. Further details to be announced in early 2019. Other works to be showcased include the world premiere of Aisha and Abhaya by Kibwe Tavares & Sharon Eyal, Ghost Dances by Christopher Bruce – the final performances of one of the most celebrated contemporary dance pieces of its generation – and Goat by Ben Duke.